THE rival presidential candidates in Afghanistan have ended the six-month political impasse and signed a deal that will make Ashraf Ghani Ahmadzai the new President. WHILE our economy continues to be among the fastest-growing, WHO (World Health Organisation) figures show our poor ranking year after year for public health spending. No wonder, according to a study funded by a few foreign agencies, by 2030 India will witness 9.3 million premature deaths, before the age of 70, which will be the highest number of premature deaths anywhere in the world. In 2009 India ranked 171st among 175 countries in terms of its spending on health. IT has been a turbulent week of war and peace. The Chinese President's visit was the highlight with peace being talked even as a mini-war was being waged in Ladakh, eyeball to eyeball, following Chinese objections to the construction of a small irrigation work near Demchok. Twelve trade and investment agreements were signed and the Chinese offered $20 bn worth of investment in five years to correct the present trade imbalance. Yet, the Ahmedabad Mirror reported that Northeasterers on the staff of the Hyatt Hotel were kept out of sight so as not to offend the Chinese guests. If true, this would be a sad self-goal and a rude slap in the face our Northeastern citizens. Recently a prominent medical journal reported about a 53-year-old woman suffering from depression and anxiety due to a hoarding syndrome. She had been living in the basement of her apartment, eating in restaurants and using a local gym for her daily bath. Her problem was that her own apartment was so full of clothes, books, magazines, suitcases and boxes, jam-packed with items, that she was no longer able to enter her own home! The very thought of discarding anything made her very edgy. The local foods movement, or the move to focus on locally grown vegetables is a backlash against industrial farming and factory processing. The latter provides cheap, calorie rich, easily available, more- palatable-than- nutritious food but compromises human as well as environmental health. THE mechanisation of agriculture and the development of the agrochemicals after World War II, helped to increase food-grain production. In addition, the factory farming of animals, large-scale food processing and with the availability of the refrigerated transport, increasing food miles became a norm for these businesses to expand for better profits. The industrial food system thus developed favoured large corporate farms and the small and marginal farmers struggled and were dislocated. THE rival presidential candidates in Afghanistan have ended the six-month political impasse and signed a deal that will make Ashraf Ghani Ahmadzai the new President. Abdullah Abdullah will nominate the chief executive officer under the agreement that lays the groundwork of a new government. The two rivals have managed to overcome wide differences to forge this arrangement. The new government will face many challenges, but at the outset, it must be acknowledged that the coming together of the two main rivals in Afghanistan raises expectations of the Afghan people as well as the international community. The elections were contested fiercely and debated endlessly. Now the new arrangement gives hope of a fresh beginning. Much will depend on how the two leaders make other appointments. While they say that merit will be the main consideration, loyalists would expect to be rewarded, and the two teams would expect equal representation. Though likely to be contentious, these problems are hardly insurmountable, and are, indeed, a regular feature of all democracies, which Afghanistan richly deserves to be, and for which some Afghan voters have paid a high price — braving improvised bombs and even losing their fingers to the Taliban who did not want them to vote. US Secretary of State John Kerry, who brokered the deal, was quick to welcome the agreement, as were representatives of other Western governments. The new Afghan President will be expected to sign a security agreement with the US that would allow foreign troops to remain in Afghanistan after the US and its allies withdraw their troops. The country will face major challenges after the Western troop withdrawal. While the government may find it difficult to fill the economic and military gap that would be created after the withdrawal, Afghans will demand better amenities, and expect better governance. Tribal rifts could further aggravate the situation. Though the road ahead is bumpy, a good beginning has been made with two erstwhile enemies vowing publicly to work together for the unity and progress of their country. WHILE our economy continues to be among the fastest-growing, WHO (World Health Organisation) figures show our poor ranking year after year for public health spending. No wonder, according to a study funded by a few foreign agencies, by 2030 India will witness 9.3 million premature deaths, before the age of 70, which will be the highest number of premature deaths anywhere in the world. In 2009 India ranked 171st among 175 countries in terms of its spending on health. Nearly two million children under five continue to die every year — the highest in the world. More than half die in the month after birth and 400,000 in their first 24 hours. If malnutrition, neonatal diseases, diarrhoea and pneumonia grow unchecked, causing children’s death, tuberculosis, malaria and other chronic diseases trigger early death among adults. The major cause of all these deaths is the unavailability of preventive and curative healthcare in the rural and poor urban areas. The figures collected by foreign researchers escape our own officials due to a faulty system of collecting death-data. The data collected by officials often fails to register the cause of death, which is a crucial link in determining how health budget should be planned and spent. In a project undertaken by a professor of Toronto University in 2001 called “Million Death Study”, it came to light that malaria deaths were 13 times higher than the number reported by WHO due to a faulty death registration system. HIV/AIDS deaths were lower than official estimates and suicides and snakebites were taking more young lives than estimated by the crime record bureau or hospital registers. One of the biggest surprises was the discovery of smoking-related deaths, which helped the officials in convincing the government to tax the tobacco products heavily. Apart from healthcare, which needs more budget allocations and proper monitoring, death registration should be made comprehensive to plug the death-causing agents. Both these efforts can curtail premature deaths in future. THE appreciative and graceful reference which, in the course of his speech in Council, His Honour made to the helpful attitude of the provincial press will be read with interest. His Honour said he desired to acknowledge "the patriotic spirit and the discretion which the Press generally has shown since the beginning of the war" and which, he hoped, "will be maintained while the war lasts." In time of war, said His Honour, the Government of almost every country arms itself with special powers of censorship and control in regard to the Press, but he sincerely trusted that "the wisdom and self-restraint of the Press in the Punjab will render the exercise of such power unnecessary." THE other day we complained that there was not a single Government High School for Girls maintained by the Punjab Government in spite of its anxiety to advance female education and a Female Education Conference having been held. The Bengal Government has issued a resolution appointing an influential committee to suggest what should be done to advance education of Hindu Girls on popular lines. The object is that the education should be designed to be useful to the Hindu girls and be in accordance with the domestic and social ideas of Hindu society. His Excellency the Governor is also conscious of the economic forces in Hindu society that tend to postpone the age at which girls are married and says their education should be such as would stand them in good stead "should early widowhood or some other unforeseen calamity throw them on their own resources." The course should be self-contained and capable of being completed by the age of 14 and be consistent with best traditions of Hinduism. 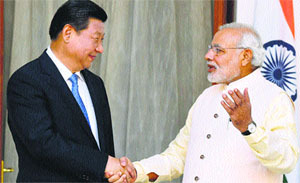 Prime Minister Modi, however, did well to tell President Xi that while trade and other exchanges were most desirable, no real progress and lasting friendship was possible without speedy settlement of the boundary issue. Three specific issues were mentioned: defining the LAC to ensure peace, with demarcation to follow; avoidance of stapled visas, and water sharing. Water-sharing is not a real issue as China's ability to divert waters from India is modest. The real water issue lies in managing climate change, which was apparently not discussed. Both sides have much to gain from such cooperation. As far as the border is concerned, the Chinese have since 1954 maintained the ambiguous position that matters will be settled when the time is ripe. Thus even when a section of the LAC is mutually determined, the Chinese are unwilling to demarcate it and exchange maps. India must insist on firm ground rules here. Mr Modi did not address the media during or after the visit. He has studiously avoided speaking to the media since taking office. But all of a sudden he has come alive in a “world exclusive” interview with CNN on the eve of his US-UN visit. This seems more an exercise in self-publicity than in communication, in which he blandly suggests that Muslims in India are absolutely safe even while the BJP and the Parivar have tirelessly indulged in an unrestrained campaign of slander, lies, dire threats and the most infamous calumny against them. This will not wash unless and until he takes action against some of his leading lights for criminal incitement, hate-mongering and propagating downright lies. The recent by-election results in which the BJP lost 13 of the 23 seats spread over 33 constituencies in nine states is indicative of growing public disenchantment with the blatant electoral politics of hate and polarisation that the BJP banked upon. It suffered in UP and Rajasthan in particular. The BJP leader in Bihar openly declared that if Yogi Adityanath spoke in Bihar as he did in U.P. he would have been promptly contradicted. Adityanath’s rants apart, recall what some others said. Amit Shah, the BJP president declared that if Patel, not Nehru, had been “in charge” of Kashmir, the entire state would have come to India and there would have been no need for Article 370. This combines a high order of constitutional ignorance with historical illiteracy and a false pitting of Patel against Nehru in a new game of personality polarisation. Sakshi Maharaj, BJP MP, next alleged that madrasas are imparting instruction in terror and love-jihads. They do not hoist the national flag and Muslim MPs avoid functions where the national anthem is sung. The BJP disowned these outrageous statements as the personal views of the MP who, however, remains in good standing. Then it was left to Maneka Gandhi, Minister for Women and Child Development, to claim that profits made from animal (read cow) slaughter are going to fund terrorism. This again is sheer rubbish and also betrays ignorance of the trade. The plain fact is that the bulk of cattle sold for slaughter are non-milch buffaloes and are disposed of by Hindus who cannot afford to keep dry and decrepit animals. Mechanisation of tillage and haulage has also reduced the demand for draft animals. Rather than acknowledge the facts and permit culling and rendering of animals and sales of processed beef, people are driven to illicit sales of cattle across the border to Pakistan, Nepal and Bangladesh. Most gaushalas are rackets of bogus piety and serve no purpose. That apart, millions of "holy cows" roam the streets and forests and do much damage to the ecology. In Madhya Pradesh, a BJP MLA, Usha Thakur, asked her followers to keep Muslims out of the Garba festival to prevent Hindu girls from being trapped in love jihad. These are demented minds that would convert beautiful national festivals that bind our diversity into occasions to preach hatred and divide communities. No wonder the National Minorities Commission has written to the Home Minister “to restrain people in responsible positions from making irresponsible statements”. An earlier resolution by the commission was ignored. Modi sarkar does not care and has said or done nothing for months to stop this monstrous Hindutva hate jihad. And is this the man who is telling the world in an “exclusive interview” with CNN that Muslims need have no worry? Statesmanship or humbug! Were this not enough, we have witnessed the arrogance of power in play. Ajit Singh, a former minister, has refused to vacate his bungalow despite repeated reminders, like several other defiant ministers, MPs and bureaucrats. He wants the bungalow converted into a memorial commemorating his father, Charan Singh. The Nehru-Gandhi example of endless land-grab for family memorials has created a terrible example. The Indira Gandhi National Centre for Culture and Art in the prime heart of Delhi represents the acme of land grab and the most extravagant use of space that it must disgorge to accommodate other cultural institutions. The answer to Ajit Sigh and all similar defaulters is that their household goods should be dumped on the road and auctioned and all arrears and costs be met therefore. Protest should be met with arrest and a month's imprisonment. Do this just once under the law and the nonsense will end. Then there is Hema Malini telling the tragic widows of Brindavan, mostly from Bengal and Bihar, not to crowd the place but remain in their home states. What impertinence from a woman who embraced Islam temporarily to marry after her partner-to-be secured talaq. What has she or the Parivar done to end the terrible plight of widows who are as yet unable to break the cruel taboo against widow remarriage, though abolished by law. These medieval bigots are the dregs of Hindu society. Meanshile, we have Yasin Malik forcibly stealing a boat-load of rations for Srinagar’s flood affected to divert to his partisans in order to claim credit for looking after their welfare even while protesting the state's alleged indifference and incompetence in rescue and relief operations. These separatist scoundrels have thrown stones at Army and Air Force rescue teams. They deserve to be horse-whipped and locked away. Hoarding behaviour begins in the early teens as a mild form, becoming a moderate problem around the third decade of life and could become an obsession by the middle age. It stems from the thought that in future the thing hoarded would be useful. But the perceived importance of the hoarded items far exceeds their true value. In actual it may have only an aesthetic or a sentimental value. Thus people, who hoard, treasure everything. Some people are fond of collecting items which they actually do not need nor have the space to keep them. Go to the Wal-Mart, Big Bazaar or Metro stores, and you will soon be joining this group due to the collection of unwanted items! Different people hoard different kinds of things. In the 19th century, Sir Thomas Phillipps collected about 40,000 printed books and 60,000 manuscripts in his lifetime, the dispersal of which, after his death, took over a century! Some animal lovers hoard pets without having the ability to actually care for them! Commercial hoarders purchase large quantities of a commodity with the intent of pushing up the price like it happened recently with tomatoes and onions. Civilians may hoard foodstuffs, water, gas etc. during curfews or natural disasters. The hoarders suffer from obsessive compulsive disorders due to bad mental hygiene which creates bad mental habits. They have a difficult time making decisions as to whether something is useless or not. Their quality of life is substantially compromised and they have no social standing. The risk to their life is great due to a fire, fall or health hazard as a consequence of their hoarding. Such people really ‘live dangerously’. In 2007, a 79-year-old woman died when fire-fighters were not able to get to her in time due to the excessive accumulation of things in her home. In another case, Homer and Langley Collyer, living in Manhattan, hoarded newspapers, books, furniture, musical instruments, and other items and set up booby traps in corridors and doorways to protect themselves from intruders. Eventually they were found dead, surrounded by over 130 tonnes of waste that they had collected over decades! While in the USA on a study programme during the late eighties, I used to be under shock observing large beds and television sets thrown out into the garbage, particularly by people who had mobile homes or those who could not carry everything along with them. All these things came up for grabs by someone else, who were likely hoarders! Well, we can only hoard — till death do us part! THE mechanisation of agriculture and the development of the agrochemicals after World War II, helped to increase food-grain production. In addition, the factory farming of animals, large-scale food processing and with the availability of the refrigerated transport, increasing food miles became a norm for these businesses to expand for better profits. The industrial food system thus developed favoured large corporate farms and the small and marginal farmers struggled and were dislocated. Meanwhile, Rachel Carson, a marine biologist published her book Silent Spring, in 1962, in the USA. The book criticised the “use of agrochemical, the pesticides, fertilisers and weed killers that can have devastating effect on the biodiversity”. The title of the book referred to the ultimate disappearance of songbirds because of the effects of DDT. The people who disproved the use of agrochemicals, started growing their own food and patronised the local food growers who did not use pesticides. As this food movement expanded, the growers started labelling the produce as local and organic and by the 1980s it became available in the stores. A flourishing profitable market for the pesticide-free organic produce had been established by 1990s and initiated the process of consolidating the ‘organics’ for the large store outlets. In 2002, when, the US Department of Agriculture standardised the procedures for the certified production of the organics, it resulted in economic hardships for the small growers as they struggled to meet the compliance procedures, whereas large organic producers were able to do so at a much lower cost. The small growers reached out to the consumers to sustain themselves and the “Local food movement” became gradually more visible in the USA. The practice of organic cultivation is rooted in the traditional agricultural practices in India and the rest of the world, as prior to industrialisation, all agriculture was organic and in complete harmony with nature and the consumer communities. The local food movement had gained strength when the organics became a mainstream corporate business. Thus it was a movement “beyond certified organics”, wherein the consumers patronised the small independent local farmers and natural foods cooperatives in their vicinity who did not use pesticides. They linked themselves with the family farmers, who in turn reached out to hundreds of consumer families and the “Community-Supported Agriculture (CSA)” system was developed, in which consumers buy shares in advance for the farm produce. Good Natured Family Farms is now an “alliance of more than 100 family farmers, who are third or fourth-generation farmers, committed to maintaining local consumer connections. New Seasons Market in the Portland and Oregon also includes names of the farmers on the labels and employs a full-time person to liaison with their local farmers. Importance and popularity of local food can be seen in USA, when on Saturday, the bleary-eyed “locals” clutching their lattes and iPhones gather at the village's farmers market in Oak Park, Illinois. In Chicago, chefs and restaurateurs connect the “small food producers” from around the Midwest, fruit growers from Michigan and corn farmers from Illinois at the popular doughnut booth. Charitable organisations are also doing their bit to connect the local farmers and producers directly to the consumer’s communities. Chicago's Green City Market, founded in 1998, was patterned after the open markets of Paris, drawing nearly 200,000 visitors a year. In addition, the local produce is available on roadside stands, at u-pick farms and food hubs, innovatively as “rent-a-tree”, “rent-a-row”. “rent-a-garden” and consumers collect the produce in “U-pick” operations. The consumers of local foods support thousands of small and marginal farmers, and their number is increasing throughout the world and is being patronised across the world in different ways. Riverford Alliance, in the UK, initially Devon’s farm, supplied fresh fruits and vegetables to 30 friends. It is now the Riverford Organics, a multi-farm CSA, delivering thousands of fruits and vegetable boxes every week to homes across the country, thereby serving 50,000 customers. In Wales, Fork2fork encourages people to buy food directly from farmers. European local food consumers also want the food stores to label where the food originated from, name of the farmer and the region. Australian Northwest Territory promotes local food through labelling laws enacted in 2008 to designate the origin for fresh produce. Canada’s food industry, in Cultivating Opportunities: Canada’s Growing Appetite for Local Food, has reported that “it is not a fad”, has been around for 10 years and is particularly strong in Quebec, Ontario and British Columbia. Seoul Farmers Market in South Korea was opened in Gwanghwamun Plaza in the heart of the city in June 2012 and food prices came down by 20-30 per cent. The Shokti Doi movement from Bangladesh is spreading in developing countries too, as this locally produced yogurt snack, meaning “power yogurt” in Bengali, is the result of a joint venture between Bangladeshi microfinance organisation Grameen Bank and France-based food giant Danone to provide rural children with important nutrients that are missing from their diets. This also creates jobs for the local community and costs 10 cents per package, one-fourth the normal price for yogurt in the country. In India, we have Nalla Keerai’ (“Good greens” in Tamil) farming in and around Paakam village in Thiruninravur. It was founded by an organic farmer, R. Jagnathan, after studying the village economy of 240 farmers who spent Rs 40 lakh on fertilisers and pesticides during the crop season, which could be channelised to live healthy and productive lives. He captured the imagination of young software and technical professionals, who gave up their well-paid jobs and comfortable urban lifestyle to, became full time farmers. It started as a team of two in 2011 and is now a collective of 30 members. They use modern methods of marketing and have close to 8,000 followers on their Facebook page (https://www.facebook.com/NallaKeerai). It has also become community-supported agriculture (CSA), as about 15 people have invested in their land for an “yearly supply of fresh produce”. However, the “50-mile diet restaurant” in the Spice Village of Kerala is known for its commitment to local food and environment-friendly practices. They source all their ingredients from within a 50-mile radius, and do not serve anything which they cannot find locally, or will use alternatives like jaggery syrup instead of sugar. 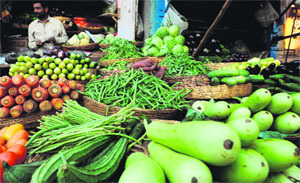 The Apni Mandi for direct marketing of farm produce in Punjab, (although it has been taken over by the local venders and traditional vegetable and fruit retailers) and efforts in various forms in other parts of India have resulted in provisions for direct marketing of local produce by the farmers. Another movement in the same direction is the “Slow Food Movement”, having a global following. It was founded in 1986 by Carlo Petrini in Italy. It began as resistance against the opening of McDonalds outlet near Spanish Steps of Rome and aims to promote “local foods, centuries-old traditions of gastronomy, sustainable good and tasty food production. This is to be as per the characteristic of the local ecosystem in a clean way that does not harm the environment and animal welfare or our health, equal access to quality food as well as the food producers receive fair compensation for their work and promotes local small business.” People who “eat locally grown food call themselves Locavors’ and the word has been recently incorporated in the American Oxford dictionary. Many people still underestimate the importance of the local food movement and find it hard to comprehend the broader perspective. It is actually a backlash against industrial and factory processing that provided cheap, calorie rich, easily available, more-palatable-than-nutritious food. These practices compromised the human and environmental health, favoured large farms, marginalised the small growers, increased the food mileage and carbon footprint of food on earth and decreased the farmers’ footprint on the farm. The local food movement is for pesticide-free quality fresh and nutritious food, that reduces food miles and helps to sustain the environment, natural resources, human health and local traditional food systems. It ensures agricultural diversification, contributes towards durable local farming communities, natural resource conservation, climate resilience, local agricultural/ regional economy and is sustainable.The food is being grown by the farmers as per the consumer needs; it promotes crop diversification. Besides this, it builds community bridges and fosters cohesive rural interdependent urban communities, thereby adding to the social capital. Until 1920s, all the food was locally grown and was organic in the world with hardly ever any food miles added to it. However the “movement for organics” had gathered pace in the 1940s, in England and Europe, because of the scientific studies carried out since early 1930s by Rudolph Steiner, J.I. Rodale, Lady Eve Balfoinur, and Sir Albert Howard. The global demand for organics in the world is increasing now, because of food safety and health concerns. The market share of all natural, organic, local food and uncertified foods labelled as pesticide-free, hormone and antibiotic-free, (grass-fed, free-range, GMO-free, and un-pasteurised included) was $4 billion in 2002. This market share increased to $11 billion in 2011 in US. The annual global growth potential is 20 per cent. India exported around 1.34 million tonne of certified organics (sugarcane, cotton, Basmati rice, pulses, tea, spices, coffee, oil seeds, fruits and their value-added products, functional foods and 40 per cent world’s organic cotton fibre), to the EU countries, US, Switzerland, Canada, Southern and Middle East and Asian countries, from Madhya Pradesh, Rajasthan and Uttar Pradesh, valuing more than $374 million. There is also an indigenous market, with about 95 per cent of the brands existing in top 10 metropolises and other tier-II cities. The market economy of the outsourced industrialised organics is booming. In order to give it a boost, it would have to be re-branding of the consumption habits of the rich, with marginal contributions to the complex aspects of sustainability. The food miles of the air-freighted corporate organics are thus being questioned and UK Soil Association, the certifying body, is being pushed to promote only locally grown, or at least British-grown food to maintain the integrity of the organic brands. The philosophy behind organics is environmental conservation, food security and protection of the peasant communities. The general realisation of this fact is reflected in the increasing consumer patronage and the number of farmers’ markets in the UK. It finds voice in community-supported agricultural projects as well as explosive growth of farmers’ market, chefs and restaurants. There is increasing government investment, initiatives and incentives to promote local food systems in developed and developing countries. * The local food movement is geared towards reshaping and shifting the balance in favour of local, fresh, flavoursome foods. * The move seeks to focus on small farmers and sustainable agricultural practices. * It creates a compelling need for mankind to think of a new policy framework for the convergence of agriculture, environment and human health concerns. * Scientists, public health and businesses should converge to understand the linkages between the food, consumers, health, agriculture and the environment. * The effort is to build a sustainable value chain for human health,environment and society. Former Dean Postgraduate Studies, Punjab Agricultural University, Ludhiana.